March planned in Washington D.C. The destruction of heritage in Mosul and Nineveh in Iraq has brought attention to how antiquities are at risk, and led to requests for interviews from H4P. This provides an opportunity to talk about H4P and what we do to safeguard Syrian heritage during the present crisis.On February 27 2015, Isper Sabrine of Heritage for Peace discussed the recent events in Mosul on Hoy empieza todo con Marta Echeverría, on Spanish National Radio’s Radio 3, found here, as well as an interview with Radio Nacional de Espana. Rene Teijgeler was interviewed by various agencies including the Dutch national Press Agency Algemeen Nederlands Persbureau, or ANP (27 February), the Belgian newspaper De Morgen (28 February) and national radio De Ochtend (3 March), the Dutch newspapers Trouw (5 and 7 March) and De Volkskrant (7 March), and the Dutch National Radio 1 –Journaal (Newshour 6 March). Heritage for Peace ran a seminar in Barcelona with the Catalan Institute of Cultural Heritage and the Spanish Council of Research on February 21 2015. Photos can be found here and details of the event here. 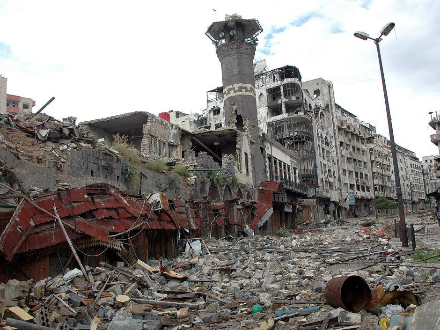 Vivid photograph from Lens Young Dimashqi shows the damage to the dome of Abed Al-Qader Al-Hussaini Mosque in Yarmouk, Damascus (February 22 2015), here. 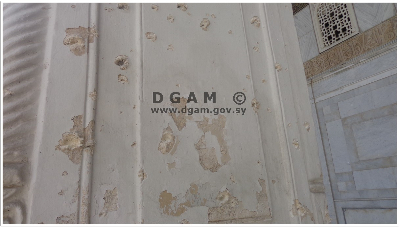 The DGAM reports that several buildings in Old Damascus, including the Umayyad Mosque, have been damaged by a bomb. The attack took place on February 5 2015, and many photos can be found here. Images show damage, some very severe, to Al-Dalati/Al-Dalaty Mosque in Hammedyia/Hamidia, Homs, shared by Protect Syrian Archaeology (February 17 2015) here. Video shows the damage of Darqouta/Der Qita site from ancient villages of Northern Syria, Idlib, shared by Protect Syrian Archaeology (February 22 2015) here. 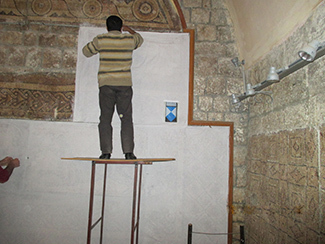 Videos by Ismael Abed Alrahman show damage to Khan al_Basha, Aleppo here, as well as Aleppo’s Qadi Askar Mosque (March 1 2015) here, shared by Protect Syrian Archaeology. The DGAM reports on March 4 2015 that attempts at looting by armed gangs around Tell Ammar in Northern Syria have been rebuffed by the local community here. Looting continues to be a major problem throughout Syria. See the ‘International Activity’ and ‘News’ sections for more information. The DGAM is undertaking a digitization project to preserve important, historic maps and documents from archives considered to be at risk due to the conflict. For the brief with pictures, see here. The DGAM participated by video conference in a Tokyo symposium sponsored by the Japanese Agency for Cultural Affairs on February 21 and 22 2015. The conference was entitled ‘A crisis of Syrian cultural heritage and the efforts to safeguard it’ and is detailed here. The seventh meeting of the Ancient Near Eastern Seminar for the 2014-15 academic year on Wednesday, March 11, will be Dr. Michael Danti, American Schools of Oriental Research Cultural Heritage Initiatives and University of Pennsylvania Museum: “The Erasure of Millennia: The Cultural Heritage Crises in Syria and Northern Iraq”. The meeting will be held at the Columbia University Faculty House, starting at 5.30. The Penn Museum announces that the Penn Cultural Heritage Center has helped with conservation efforts at the famous museum at Maarat al-Numan, south of Aleppo. See the report (March 5, 2015) here. ASOR’s Syrian Heritage Initiative has received $57000 from the J.M. Kaplan fund to further its work, as reported here. On February 27, The School of Theology and Religious Studies of The Catholic University of America and Crossroads Cultural Center presented: “In the Eye of the Storm: Archaeology in the Midst of War in Syria”, a talk offered by Giorgio Buccellati & Marilyn Kelly-Buccellati, Cotsen Institute of Archaeology, UCLA and Federico Buccellati, Goethe University. The lecture focused on the efforts of local populations to defend their cultural heritage, revolving around the site of Urkesh in northeastern Syria (see news item below on Urkesh). On February 24 2015, the American University in Rome hosted Dr. Katharyn Hanson, who discussed ‘Protecting Cultural Heritage in Crisis: Syria and Iraq”. ASOR has published a video of the lunch presentation of its Syrian Heritage Initiative (February 6 2015) here. The World Archaeological Congress (WAC) announced the Dead Sea Accord on March 3, 2015. The Accord calls on states to protect cultural heritage, asserting ‘that the expression and preservation of culture, both tangible and intangible, are basic human rights.’ The content and context of the document can be found here. Activists are planning a march in Washington to urge the US government to do more to prevent ‘ISIS from destroying what remains of Mesopotamian civilization’ on March 10th. See the announcement here. UNESCO organised a meeting entitled ‘Improving inventories of built, movable, and intangible cultural heritage’ in Beirut between the 16th and 18th of February 2015. The DGAM participated in this event, designed in part to improve the tracing looted and stolen antiquities. For more details, see here. Aliza Litchman writes a guest post on the blog of The Council on Foreign Relations (March 6 2015), saying that the international community has not been successful in dealing with the illegal sale of cultural artefacts from Syria and Iraq, and calls for greater focus and a higher level of funding, especially on the part of the US The post can be found here. On March 2, 2015, the Wall Street Journal suggests that destroying cultural heritage should be considered a war crime here. Marina Lostal discusses ‘Syria’s world cultural heritage and individual criminal responsibility’ in an article published in the International Review of Law. The head of the DGAM, Maamoun Abdel-Karim, discusses the state of Syria’s museum collections and the looting of antiquities in Al-Akhbar (February 27, 2015) here. The Washington Post (February 25 2015) reports on the smuggling of Syrian antiquities into Britain where they are being sold to fund ISIS in an article found here. The Looting Matters blog discusses the fallout from the BBC’s coverage of the link between smuggled antiquities and IS funding here. Heritage Daily (February 25, 2015) discusses an exhibit about the history of Tall Mozan / Urkesh running in north eastern Syria here. Hurryiet Daily News (Turkey) reports the role of Turkish markets in moving stolen Syrian antiquities to Europe here. Biblical History Daily asks ‘can we prevent archaeological looting’? (February 23 2015). Syria’s culture minister argues that Syria needs to play a key role in fighting antiquities theft, in a piece by Reuters here. Syria’s culture minister accuses Turkey of complicity in antiquities smuggling in Today’s Zaman, here. The Art Media Agency reports on a February 16 lecture given by Édouard Planche of UNESCO on the looting and trafficking of goods from war zones here.